Seagrasses are benthic ecosystems that provide important services in the coastal zones, yet are declining worldwide at an alarming rate. Seagrasses provide habitat to commercially important fish and crustaceans, and contribute to coastal protection through the stabilization of sediment run-off. They play a critical role in the maintenance of biogeochemical cycles, burying approximately 12% of the global atmospheric carbon production. Rising anthrophogenic and natural threats, including human-induced climate change may negatively affect seagrasses, resulting in permanent habitat loss and reduction of biodiversity. With most of seagrass environmental monitoring based on long term responses to environmental pressures, there is a growing interest to develop alternative diagnostic tools that more effectively identify changes in seagrasses conservation status at an early stage. Diversified microbial communities are known to be associated with seagrasses above (leaves) and belowground (rhizomes and roots). These microbial communities are tightly associated with plants and have the capacity to adapt rapidly to changes in environmental conditions, helping secure meadow health and conservation. This research activity has been devoted to study the microbial communities of seagrass, to describe their structure and composition even in different environmental conditions. These studies give the necessary basic knowledge to understand the relationship microbiome/seagrass plants and their possible use as a putative marker of environmental change. A Next Generation Sequencing (i.e. 454-pyrosequencing) technique has been applied on the bacterial microbiome associated to Halophila stipulacea plants from the Red Sea. 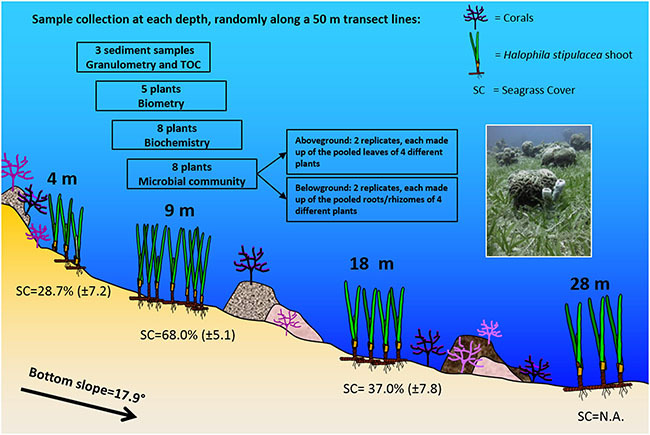 This work revealed that there are common patterns about the microbial communities associated with seagrasses; different microbial communities were found on the different plant compartments. Phylum Proteobacteria was the most dominant group on both seagrasses, among them classes Alphaproteobacteria, Gammaproteobacteria and Deltaproteobacteria were the most abundant. This work has also highlighted the link between microbial assemblages, specific environmental conditions and the plant’s eco-physiological status. This work is a stepping stone in the study of microbial communities as a marker of environmental change in seagrasses, although, more investigations are undeniable needed to properly establish and understand the seagrass microbiome functional relationship. This work was made possible thanks to the collaboration with: Gidon Winters from the Dead Sea & Arava Science Center, Hazeva (Israel); Rodrigo Costa of the University of Lisbon (Portugal); Pedro Beca Carretero Ryan Institute for Environment, Marine and Energy, NUI Galway (Ireland), and Paolo Galli and Davide Seveso from the University of Milano Bicocca. Thanks to the MaRHE prize, awarded from the University of Milan Bicocca and granted to Astrid Mejia, during the XXIV Congress of the Italian Society of Ecology in Ferrara (2014), a sampling campaign in the island of Magoodhoo (atoll Faafu, Maldives) has been performed on a Thalassia hemprichi prairie to collect the microbiome associated to plants.